Demonic Christ was formed in 1992 by Dana Duffey (then known as Satania) after the demise of the all female death/doom band Mythic. 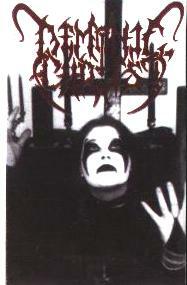 In the beginning Dana wrote all the music and lyrics for Demonic Christ using session musicians to record the first demo "Deceiving The Heavens" in 1993. Aragon Amori (RIP) of Profanatica helped out here. The tape was spread throughout the underground with the help of Osmose Productions in Europe and Wild Rags Records in the USA. Roughly 600 copies were sold. The first 100 copies were smeared with Dana's blood. Due to the success of the demo, Demonic Christ was offered a CD deal in 1994 by Robert Deathrage of the Meatshits for his new label, Morbid Granny which was to be pressed by and exclusively distributed by Moribund Records. At this time Dana dropped the corpse paint image and the pseudonym Satania due to the increasing trend in the Black Metal scene. By September there was a full line up for the band.